The administration linked closely to citizens' lives, such as welfare, school education, fire defense, roads, rivers, and other social infrastructures, is conducted in most cases by local government. Regional finance therefore plays an extremely important position, so to speak, as one of the two wheels of a vehicle together with national finance. 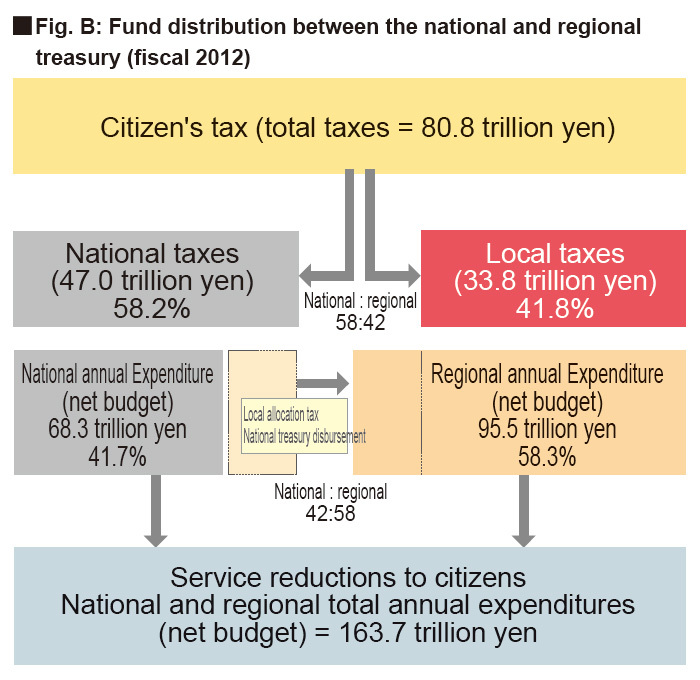 Consequently, the regional finance relating to the ordinary budget for fiscal 2014 totaled 83.4 trillion yen. Increasingly important will be securing a source of tax revenue in line with the roles of local governments, such as promoting regional sovereignty reforms, and supporting nursing, medical and parental cares designed for a society with a declining birthrate and ageing population. Regional finance is the totality of the finance of about 1,700 local governments, most of which are financially weak municipalities. The shortage of funds for regional finance increased swiftly in and after fiscal 1994 due to the decline in local tax revenues, tax cuts, and for other reasons. After that, fund shortages reached a record of 18.2 trillion yen in fiscal 2010 due to a decline in local taxes and five national taxes - the source of local allocation taxes - related to the recession. Fiscal 2014 saw in increase in tax revenue, due to a slow recovery in local taxes and national tax income - the source of allocation taxes. 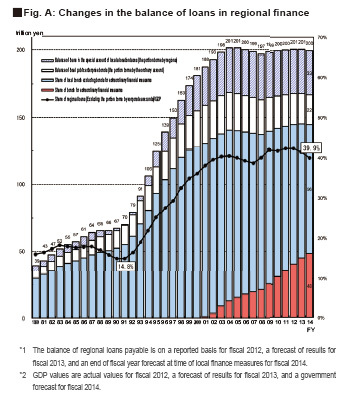 The financial deficit consequently amounted to 10.6 trillion yen, still a huge figure. 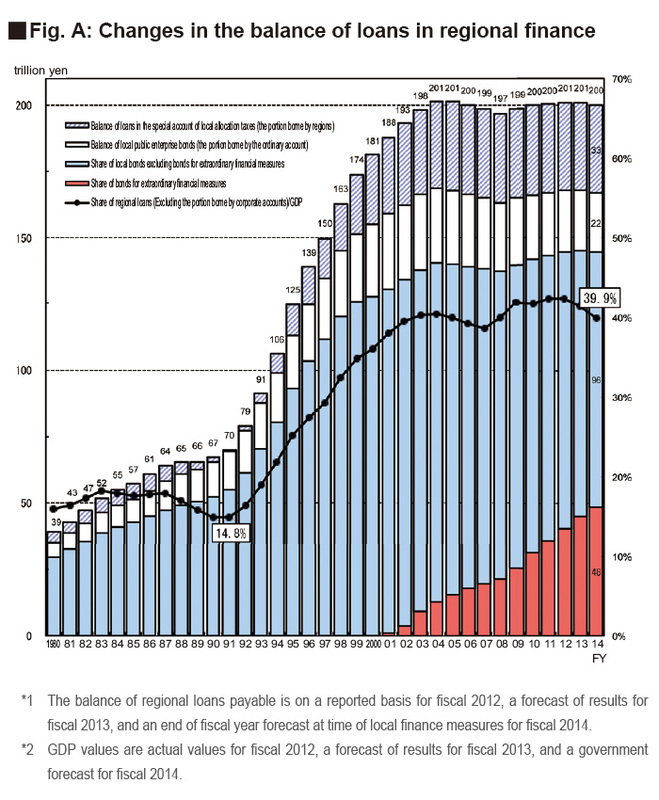 Moreover, the end of fiscal 2014 saw the balance of loans in regional finance growing to 200 trillion yen, accounting for 39.9% of GDP. This marked a 2.9-fold increase since fiscal 1991, showing an increase of 130 trillion yen. To ensure financial balance among regions, a certain percentage of national taxes (called a local allocation tax) was also appropriated to the regions as a fund with unspecified uses. Treasury disbursements such as subsidies with uses designated in general are paid out to the regions. The final spending base is therefore based on about a 2 to 3 ratio of the state to regions. The ratio of the state to regions on a final spending basis is opposite the ratio of the state to regions in terms of distributing tax revenues. Thus, the funding for local public entities to run their projects has been shifted from the state to the regions. The LPFB ensures funds for local governments through the regional financial planning (a set of plans that grasp in general the scale of regional finance, which is the financial complex of various local governments, and balance prospects) to allow local governments to carry their important responsibilities regardless of the regional gaps depending on the degree of population and industrial density and regardless of the gaps in tax revenues between fiscal years due to business trends. Through local allocation taxes and local bonds, along with other means, the LPFB ensures funds for the local public governments. Local governments should ideally be financed by their own funds, such as local taxes collected by themselves. However, in reality, fund sources are regionally unevenly distributed. A mechanism is therefore needed for adjusting this uneven distribution and for ensuring general fund sources (fund sources with their uses unidentified and which can be used for any kind of expenses) to organizations with low local tax revenues. Established for that purpose is the local allocation tax. 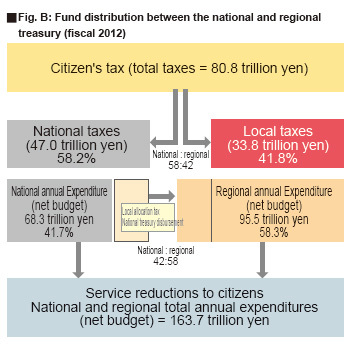 The local allocation taxes in fiscal 2014 totaled 16.8855 trillion yen. The annual expenditures of local governments are, as a rule, covered by annual revenues other than local bonds (loans obtained by local governments). However, for expenses for construction projects and other expenses, which should desirably be borne by future inhabitants, or for disasters and other situations temporarily requiring significant expenses, local bonds can be used as a fund source. Consequently, the LPFB fixed an estimate of the annual local bond issue amount and established the municipal bond plan. The appropriate allotment of local fund capital is carried out by means of tasks such as agreement to the issuing of bonds whilst maintaining local bond funds. The LPFB plans and drafts programs, takes financial measures, gives advice, and renders related services regarding local public enterprises. Local public enterprises provide projects for waterworks, traffic, hospitals, and sewage, and other services indispensable to the lives of regional inhabitants and to the development of the regions (8,724 projects at the end of fiscal 2012). The settled accounts of all the local public enterprises total 17.0246 trillion yen, accounting for a little under 20% of the settled accounts of the expenditure of the ordinary account of all the local public associations. The budget of regional finance is increasingly rigid, placing regional finance in a severe condition due to the reimbursement of local bonds issued in the past and a rise in social security expenses due to the ageing population. It is, therefore, essential to make regional finance sound. The LPFB ensures enough financial resources for stable financial management through regional financial planning etc. The LPFB helps the local governments make their finance sound under "the law relating to the financial soundness of local governments, etc." which stipulates the disclosure of financial barometers and mechanisms for the early restoration of public finance. In cases where restoration and reconstruction projects are carried out by local public bodies that have been afflicted by a disaster, ordinarily the LPFB would cover their finances by issuing municipal bonds for the share of expenses borne by said bodies. But for the Great East Japan Earthquake it took the previously unprecedented response of completely eliminating the financial burden borne by the afflicted bodies by issuing a special disaster reconstruction allocation tax instead of issuing municipal bonds for the financial burdens of these bodies when it came to restoration and reconstruction projects. This was done for two reasons: (1) Since the earthquake inflicted unprecedented damage and had an impact on Japan as a whole rather than just the directly afflicted regions, the decision was made to handle this by ensuring special financial resources, such as through a tax increase for reconstruction, for the outlays that were assumed to be necessary for restoration and reconstruction measures, and (2) Together with this, there was the concern that having the numerous afflicted bodies that had suffered a devastating blow issue municipal bonds would worsen their financial situation in the future. Moving forward, the LPFB will provide firm support so that obstacles preventing the smooth financial administration of local public bodies do not arise, so as to allow them to devote their utmost efforts to addressing restoration and reconstruction projects. Copyright (c) 2008 Ministry of Internal Affairs and Communications All Rights Reserved.